PHOTO: Bob Jackson. Highlands senior Karsen Hunter runs in the Class AA, Region 4 Meet in Union on Saturday. The Highlands girls cross country team won its sixth straight region championship. 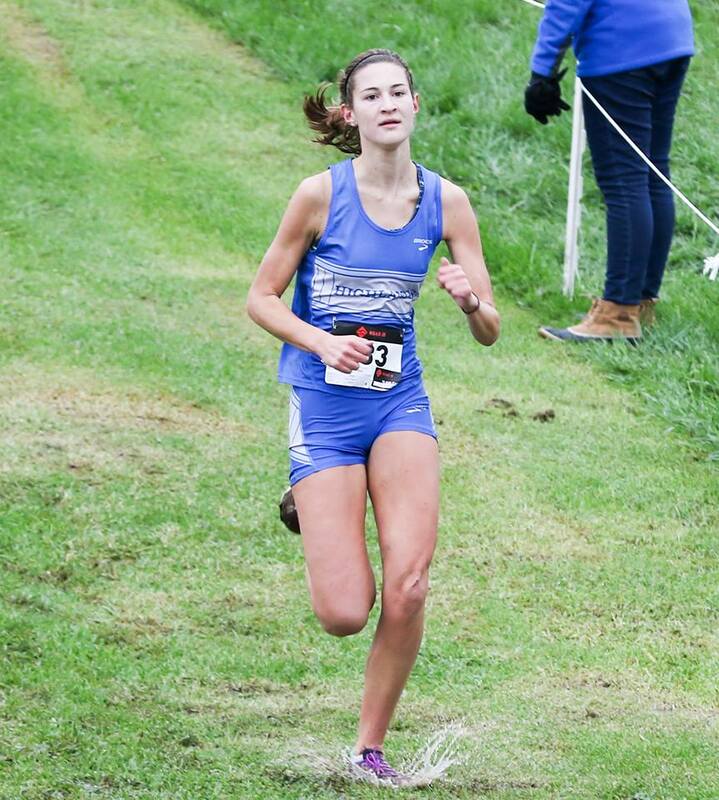 The deep Highlands Bluebird girls cross country team wants nothing more than to climb back to the top of the Class AA mountain. The first step to that came in proving its dominance in the Class AA, Region 4 meet in Union on Saturday. 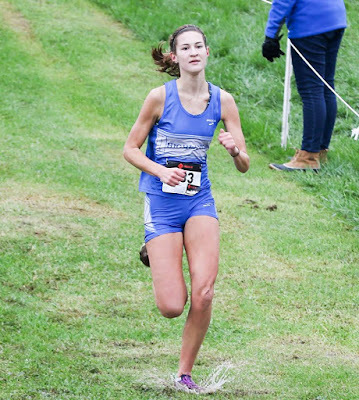 That turned out to not be an issue as the Bluebirds dominated the girls race on their way to the sixth consecutive region championship while the boys finished region runner-up. "We have a lot of talented kids, but we also have to rebuild every year you lose some girls," said Brian Alessandro, Highlands Head Coach. "That's a testament to the depth we have, too." The Highlands girls placed their five scorers in the top 11 on their way to 32 points. They outscored runner-up Bourbon County by 21 points. It started with freshman Maggie Schroeder's second-place finish in 20 minutes, 13.3 seconds. Franklin County sophomore Makena Gillion won the race in 20:04.9. Highlands sophomore Maria Broering took fourth in 20:46.6. The Bluebirds saw their next two runners cross the line after Bourbon County saw two cross. They were senior Karsen Hunter in 21:28.8 and sophomore Alissa Campbell in 21:48.4. Senior Brianna Collins finished 11th in 22:03.2. Collins and Hunter have been with all six straight region champions. "It's really weird to think that I've been to six region races and won six region championships," Hunter said. "But it's been fun. It's a lot of pressure, but not a lot of people realize, especially where we're from where we're used to winning state championships, how many hours go into preparing and working out to actually win state and win region over and over again." Highlands saw all seven runners finish in the top 15 out of 43 runners. A total of six full teams participated in the race. Highlands seventh-grader Ruby Smith took 14th in 22:10.3 and senior Savannah Brady finished 15th in 22:18.4. Lexington Catholic ran away with the boys race with 18 points and Highlands had 71 for the runner-up honors. The Knights took the top four spots. "We lost a couple guys (to graduation from) last year and I thought it would be a rebuilding year," Alessandro said. "We filled in some gaps there and just got better. I'm really pleased with second." Highlands freshman Will Griffith took seventh in 18:02. Senior Blake Shuley finished 10th in 18:29.20 and seventh-grader Sam Hopper finished 11th in 18:32.4. A pair of seniors rounded out the scoring for Highlands. Anthony Derosa took 21st in 19:08.9 and Caleb Chambers finished 22nd in 19:10.2. "The team worked really hard this season to get the runner-up title," Chambers said. "We have all been working to push each other to the very best of our abilities. We knew that region was going to be a close fight for second place. But with the consistent push from our coaches, we were able to pull second place at region." The final two Highlands runners finished in the top 30 out of 58 runners. Junior Jake Ryan took 24th in 19:20.5 and junior Donovan Staab took 30th in 20:00.9. The state meet is Saturday, Nov. 4 in Lexington at the Kentucky Horse Park. The girls race at 11:30 a.m. and the boys go at 12:15 p.m. 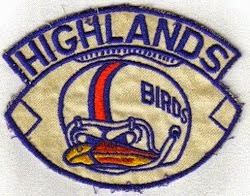 The Bluebirds could not pick up a big win to end the season. They finished 3-5 this year.